From smart intersections to fail-proof infrastructure, Gilbert is preparing for the technology of the future and new deputy town manager, Laurie Buzcek, is leading the way. Laurie joined the Town of Gilbert as the new Deputy Town Manager over innovation in early January 2018. She is providing leadership to the Innovation Hub which comprises of the Office of Digital Government, Information Technology, Human Resources and the Office of Management and Budget. 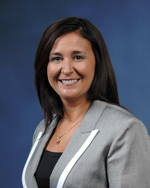 Prior to coming to Gilbert, Laurie spent 17 years at Intel where she was most recently the Global Director of Customer Experience, focusing on delivering a differentiated experience for Intel’s customers and partners. Four months into the job, Laurie is already looking at ways to enhance innovation within the organization and community. “For us, innovation is talking about how we continue to deliver the best life possible for our citizens, and thinking about things in new ways, new processes, new methods, new services and new technologies in order to be able to do that,” said Buzcek. Gilbert’s open data portal launched in December 2017 and is a project that will continue to develop in the innovation hub. The open data portal and its avatar, Alex, is the first step in making the Town’s data more accessible. Town data is being added on a monthly basis allowing for staff, businesses and the community to collaborate and innovate to find ways to improve citizens’ lives. Buzcek is currently developing an Innovation Roadmap. To learn more about Gilbert’s Open Data Portal, visit https://alex.gilbertaz.gov. 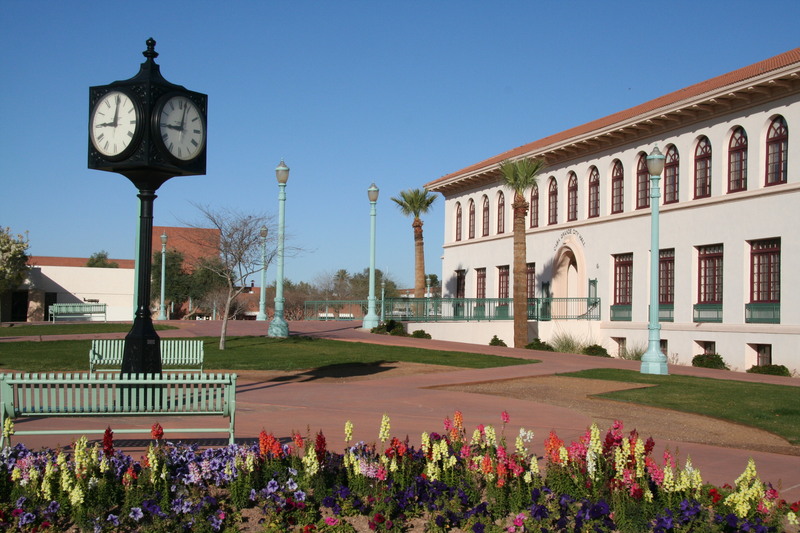 Built in 1921 at a cost of $135,000, a Spanish Colonial structure, affectionately known as “Old Main,” served as the Casa Grande district’s only high school for 76 years, Casa Grande Union High School. 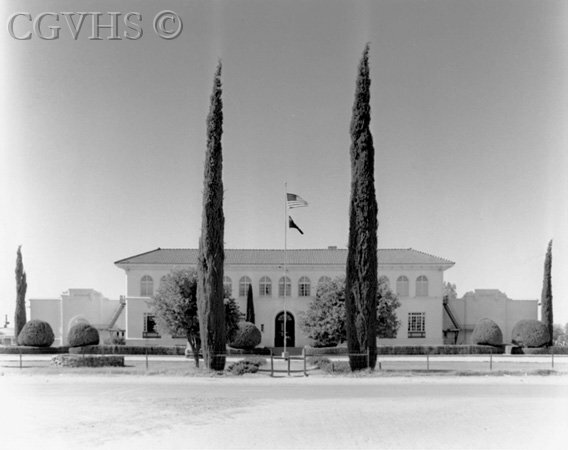 The building included a gymnasium, added in 1936, which is the only known adobe gymnasium in the state. Construction of the adobe structure was done using on-site earth to make 30,000 adobe bricks, and the manufacturing of the gym walls created much-needed jobs in Casa Grande’s deflated economy during the Depression years. In 1997, the city stepped forward to find a new use for the building when plans were made to move the school to a different site. The structure was rehabilitated with a modern interior while restoring the original exterior with the assistance of a Heritage Fund Grant. 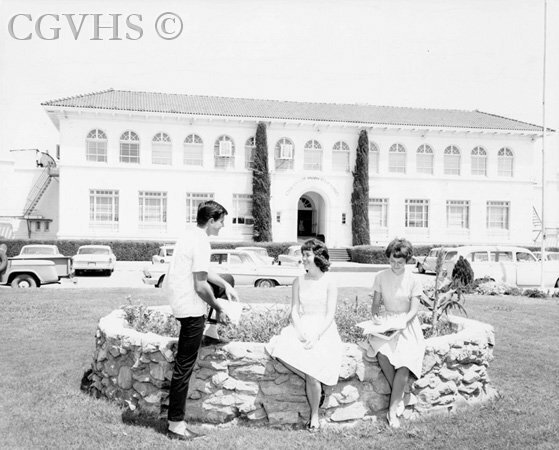 The acquisition, rehabilitation, and adaptive reuse of the high school for a new city hall was completed at the cost of over $4 million. The building now houses several key city departments, including the city manager’s office, city attorney’s office, the planning and zoning department, and the city clerk’s office. The building originally used for Casa Grande’s City Hall prior to its current site is now utilized as the Casa Grande Main Library. 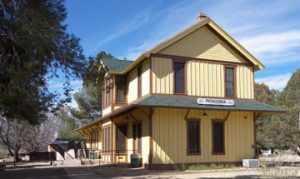 The town hall for the Town of Patagonia is actually the former railroad station! The railroad served in the Town of Patagonia until it was abandoned in 1962. The railroad was abandoned and the rails removed, but the building remained in-tact. Spearheaded by the efforts of the Rotary Club, the railroad right-of-way was conveyed to the town where it serves as a park running through the middle of the town. The station was moved from its original site adjacent to the present location and then connected to the town hall. The New Mexico and Arizona Railroad connected the southern Arizona area to Mexico with the Benson-to-Nogales Railway and passed through Patagonia. Eventually a direct rail line that extended from Tucson to Nogales, Sonora, in addition to a decline in mining activity and population in the area, led to the abandonment of the rail line. The station grounds were donated to the town and made into a town park. The depot was originally sold to a local businessman and the town eventually purchased the building that now serves as the town hall. 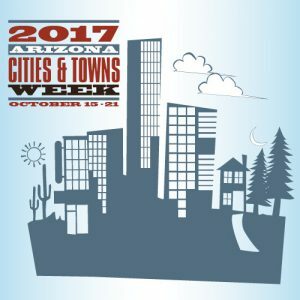 It’s Arizona Cities and Towns Week! Help us celebrate! Arizona Cities and Towns Week is set aside each year to recognize the services cities and towns provide, as well as honor those elected officials, staff and volunteers who serve in municipal government. This is the 16th Annual Arizona Cities and Towns Week. We are excited to have so many of our Arizona cities and towns participating this year, including: Chino Valley, Florence, Gilbert, Litchfield Park, Peoria, Sierra Vista, Surprise, Tempe and many others! Find out how your city or town is celebrating and participate in Arizona Cities & Towns Week by using the hashtag #AZCityWeek on social media. 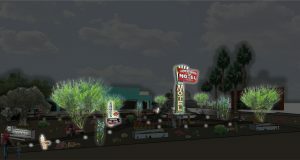 The City of Casa Grande is proud to partner with Casa Grande Main Street to participate in the “Partners in Preservation: Main Streets” national campaign to create a vintage Neon Sign Park in historic Casa Grande. 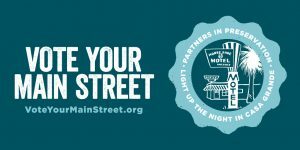 As the only Arizona community competing, Mayor Craig McFarland is encouraging Casa Grande residents and the surrounding communities to vote for the project at VoteYourMainStreet.org. Located at the Arizona Plaza at 408 N. Sacaton Street (between Florence Boulevard and 2nd Street), the proposed Neon Sign Park will contain salvaged historic neon signs from throughout the community, and will serve as a vibrant downtown destination for visitors. The public may vote up to five times daily through October 31, and winners will be announced on November 2. The sites with the most votes will get grants of up to $150,000 each, with as many projects funded as possible from a pool of $1.5 million. 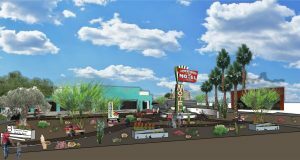 In an effort to highlight local preservation efforts and promote the campaign, Casa Grande Main Street will host a Media Open House and Community Mural Event on Saturday, October 7 at the proposed park site. The event will include a press conference to start at 11:00 am, followed by a community mural event that celebrates historic sites until 2:00 pm. Partners in Preservation is a community-based partnership, created by the National Trust for Historic Preservation and American Express, to raise awareness of the importance of preserving historic places and their role in sustaining local communities. Partners in Preservation: Main Streets will award $2 million in grant funding from American Express to Main Street districts in need of preservation support across America. 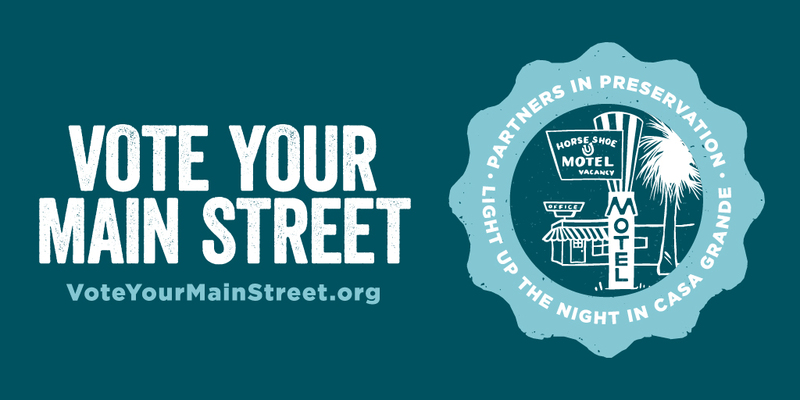 For more information about the “Partners in Preservation: Main Streets” projects, or to place your vote, please click here. For more information about Casa Grande Main Street or the proposed Neon Sign Park, please contact Casa Grande Main Street Director, Rina Rien at (520) 836-8744. City of Tempe Vice Mayor Robin Arredondo-Savage has been honored with the 2017 Service Award as part of the third annual Mesa Community College (MCC) Hall of Fame. The Service Award is given to a community member who has provided exemplary service to the community. Vice Mayor Arredondo-Savage was recognized for her years of service to the City of Tempe, the State of Arizona and our country. She is a U.S. Army veteran and served on the Tempe Union High School District Governing Board for eight years, including two years as President of the Board. She has also been serving on the Tempe City Council since 2010. As an advocate for veterans’ services, Vice Mayor Arredondo-Savage was instrumental in securing Valor on 8th, Tempe’s first affordable housing community designed for veterans with families. She also started Tempe’s College Connect program which helps students to apply and find the resources they need to go to college. Vice Mayor Arredondo-Savage remains committed to serving the community by focusing on education, jobs and programs that help veterans. This is the third year of the MCC Hall of Fame awards, which recognizes alumni, community members and MCC employees whose personal and professional accomplishments have made positive contributions to the college and the community. Other awards include Alumni Achievement, Outstanding Athletes and Excellence in Teaching. A reception and awards program to recognize this year’s awards recipients will be held on Thursday, Nov. 2 at 6 p.m. at the Mesa Community College Theatre. Click here for more information. 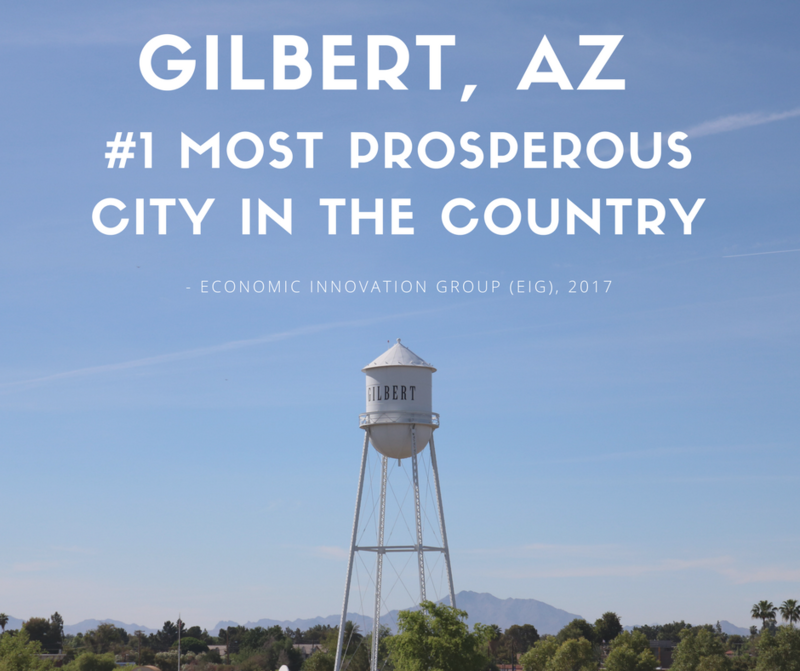 Gilbert, Arizona is the most prosperous city in the country according to the Economic Innovation Group (EIG). 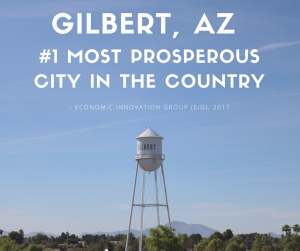 Gilbert is touted as being a “young up-and-comer” with 99.9% of the population living in prosperous zip codes. The top 100 largest cities were ranked on seven criteria: housing vacancy rate, adults not working, the poverty rate, median income ration, change in employment, and change in business establishments. Learn more about this report here. Arizona Forward awarded its prestigious Governor’s Award for Arizona’s Future to the City of Phoenix on Saturday for its landmark 2017 agreement with the Gila River Indian Community to preserve endangered Colorado River water in Lake Mead. In all, Phoenix received nine awards at Arizona Forward’s 37th Annual Environmental Excellence Awards, including four Crescordia Awards, the highest honor in each category. Mayor Greg Stanton and Phoenix City Council unanimously approved the Colorado River Conservation Agreement in June in partnership with the Gila River Indian Community, the U.S. Bureau of Reclamation and the Walton Family Foundation. Under the agreement, Phoenix works with the Tribe to preserves 13 billion gallons of its yearly portion of Colorado River water in Lake Mead, which helps preserve water levels in the dangerously over-allocated reservoir. “I was thrilled to be present at this wonderful annual event to celebrate all of the hard work and innovation that the city of Phoenix continues to accomplish,” said Phoenix District 3 Councilwoman Debra Stark. Since its inception in 1969 as Valley Forward and expanding statewide in 2013, Arizona Forward has brought business and civic leaders together to convene thoughtful public dialogue on regional issues in an effort to improve the sustainability of communities in the state. For more information about Arizona Forward or the awards, call 602-240-2408 or visit arizonaforward.org. 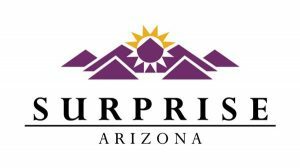 The City of Surprise Community & Recreation Services Department has received accreditation by the National Recreation and Parks Association. The Association recognized Surprise’s efforts to provide high quality parks and recreation services and experience to its residents and visitors. The Commission for Accreditation of Park and Recreation Agencies (CAPRA) has issued a five year accreditation to the city’s Community & Recreation Services Department after meeting more than 140 standards ranging from hiring practices to marketing techniques, from park planning to program implementation. Community and Recreation Services Director, Donna Miller said the department is “excited for the accreditation”, which came after a preliminary application, self-assessment study and an onsite visit by peer review performed by a CAPRA visitation team. The three-member visitation team spent several days evaluating the departments administrative and operation practices. The application and accreditation process was intensive, lasting more than 14 months. The final step was a hearing through the commission in September. Immediately following the hearing city staff received the good news and are thrilled to be recognized for following these important standards. The public will benefit from the accreditation by knowing that the city is adhering to best practices in the field of parks, facilities and programs. It also shows partners, potential funders and the public that Surprise operates under such standards. “The best part of this process is that all of the staff was involved, which provides ownership and pride in the programs and services in which they offer to the residents,” said Miller. Water professionals from all over the country were on hand Sept. 12 when the city of Goodyear’s Vadose Well Injection Project was selected as the 2017 Project of the Year Award by the national Water Reuse Association. The project consists of wells that take treated water from the city’s reclamation facility and directly pump it into the ground. This allows the city to ‘bank’ water for use during times of need. The award comes with the water industry’s acknowledgment of the significant contributions the city of Goodyear continues to make to advance water reuse. Another award-winning city water reuse program is the ‘Brine Wetland Feasibility Project’ which takes otherwise unusable water and proved it can help nourish native vegetation, therefore creating natural wetlands. The city of Goodyear, ranked as the fourteenth fastest growing city in 2015 by the U.S. Census Bureau, recently announced a historic agreement with Salt River Project that, for the first time, will bring surface water to the far West Valley further expanding and diversifying the city’s water portfolio. 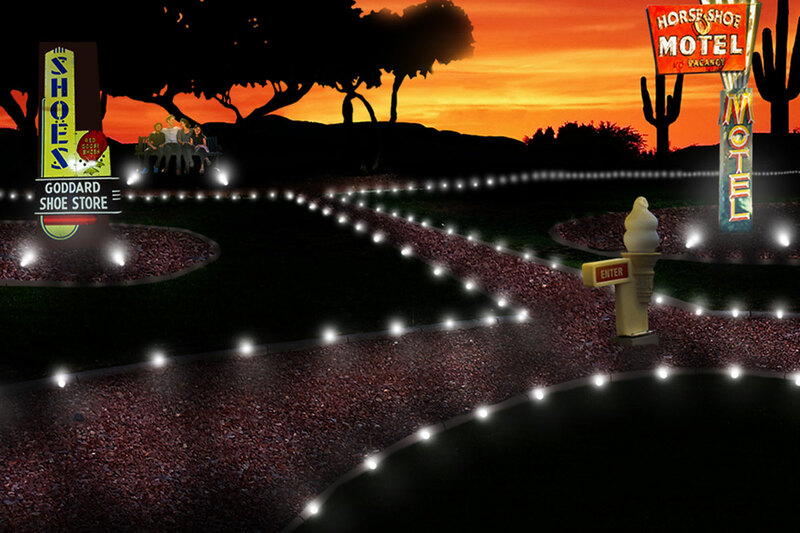 For more information about the city’s water initiatives, visit www.goodyearaz.gov/h2o365. WateReuse is an organization dedicated to educating and advocating for water reuse. Members include water utilities, businesses, government agencies and not-for-profit organizations dedicated to recycling water to ensure communities have a safe, reliable and cost-effective supply of water. More information is available at watereuse.org.